Justin Kurtz started the "Kalamazoo Residents Against T&J Towing" Facebook group after claiming the company erroneously towed his car. Now the group's 7,300+ strong and T&J Towing is suing the Western Michigan University student for $750K. It is my firm belief that my car was recently "broken into" but all that was stolen was my arboretums parking pass. 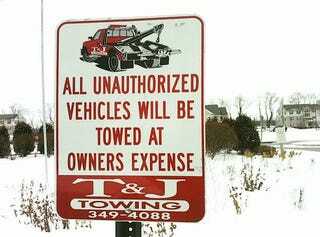 This was an act by T&J so that they could charge me $120 to get my car out of impound. Please invite your friends to get justice against T&J!!! Other users from the area piped in on the page with their own T&J horror stories and the company, which has an "F" rating from the local Better Business Bureau, wants him to take it down and pay them $750K for the business it cost them. News of this is spreading across the internet and the Facebook group and support is pouring in from around the country. We've seen this happen before and it rarely ends well for the companies who go up against the Internet. So let's help Kurtz out. If you're against shady towing operations, go join his group. UPDATE: When you join the Facebook group let'em know you're from Jalopnik by dropping a note on their wall!